Americium (chemical symbol Am, atomic number 95) is a radioactive, synthetic metallic element, classified as an actinide. It was the fourth transuranic element to be discovered, obtained by bombarding plutonium with neutrons. It was named for the Americas, by analogy with europium. This element, which can be produced in kilogram quantities, and has several uses, particularly in the form of the isotope 241Am. For instance, one type of smoke detector contains a tiny amount of 241Am as a source of ionizing radiation. 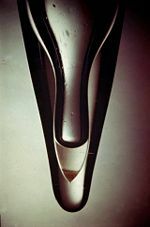 In addition, this isotope has been used as a portable gamma-ray source for radiography, and it provides a way to gauge the thickness of glass. Another isotope, 242Am, is a neutron emitter and has found uses in neutron radiography, but it is far more expensive to produce. Americium was first isolated by Glenn T. Seaborg, Leon O. Morgan, Ralph A. James, and Albert Ghiorso in late 1944 at the wartime Metallurgical Laboratory at the University of Chicago (now known as Argonne National Laboratory). The team created the isotope 241Am by subjecting 239Pu to successive neutron capture reactions in a nuclear reactor. This created 240Pu and then 241Pu which in turn decayed into 241Am via beta decay. Seaborg was granted patent 3,156,523 for "Element 95 and Method of Producing Said Element." The discovery of americium and curium was first announced informally on a children's quiz show in 1945. Americium is an inner transition metal of the actinide series, located in period seven of the periodic table, between plutonium and curium. The pure element has a silvery and white luster. At room temperature, it slowly tarnishes in dry air. It is more silvery than plutonium or neptunium and apparently more malleable than neptunium or uranium. Alpha emission from 241Am is approximately three times that of radium. Gram quantities of 241Am emit intense gamma rays which creates a serious exposure problem for anyone handling the element. Americium is also fissile; the critical mass for an unreflected sphere of 241Am is approximately 60 kilograms. It is unlikely that Americium would be used as a weapons material, as its minimum critical mass is considerably larger than more readily obtained plutonium or uranium isotopes. In aqueous systems the most common oxidation state is +3. It is much harder to oxidize Am(III) to Am(IV) than it is to oxidize Pu(III) to Pu(IV). Currently, scientists in several parts of the world are working on reducing the medium-term radiotoxicity of waste from the reprocessing of used nuclear fuel. Toward this goal, the solvent extraction chemistry of americium may play an important role. Americium, unlike uranium, does not readily form a dioxide americyl core (AmO2). This is because americium is very hard to oxidize above the +3 oxidation state when it is in an aqeuous solution. In the environment, this americyl core could complex with carbonate as well as other oxygen moieties (OH-, NO2-, NO3-, and SO4-2) to form charged complexes which tend to be readily mobile with low affinities to soil. Many radioisotopes of americium have been characterized, with the most stable being 243Am with a half-life of 7370 years, and 241Am with a half-life of 432.7 years. All of the remaining radioactive isotopes have half-lives that are less than 51 hours, and the majority of these have half-lives that are less than 100 minutes. This element also has eight meta states, with the most stable being 242mAm (t½ 141 years). The isotopes of americium range in atomic weight from 231.046 amu (231Am) to 249.078 amu (249Am). This element can be produced in kilogram amounts and has some uses. In most cases, the isotope 241Am is used, because it is easier to produce at relatively high purity. Americium has found its way into the household, where one type of smoke detector contains a tiny amount (about 0.2 microgram) of 241Am as a source of ionizing radiation. 241Am has been used as a portable gamma ray source for use in radiography. The element has also been employed to gauge glass thickness to help create flat glass. In addition, 242Am is a neutron emitter and has found uses in neutron radiography, but this isotope is extremely expensive to produce in usable quantities. ↑ Americium Retrieved December 6, 2007. ↑ Fissile Materials & Nuclear Weapons Retrieved December 6, 2007. ↑ The Chemical Complexities of Plutonium Retrieved December 6, 2007. Winter, Mark. Americium The University of Sheffield and WebElements Ltd.
Thomas Jefferson National Accelerator Facility, Office of Science Education. It's Elemental: Americium Jefferson Lab. Hazardous Substances Data Bank. Americium, Radioactive. TOXNET, National Library of Medicine.